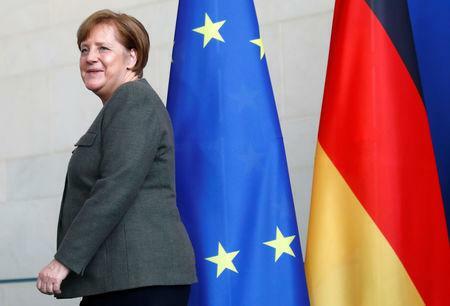 BERLIN (Reuters) - German Chancellor Angela Merkel said on Tuesday the European Union had made far-reaching proposals to Britain on Brexit to ease its concerns and this was the final offer. British lawmakers are to vote later on assurances agreed between the EU and British Prime Minister Theresa May late on Monday on the Irish backstop arrangement, but it is far from clear whether they will back the divorce deal. "Today is an important day," Merkel told reporters at a joint news conference with Belgian Prime Minister Charles Michel. "Clear, far-reaching proposals have been made that take into account the concerns of Britain and that seek to find answers to them," Merkel said, adding that she wanted an orderly Brexit and the British parliament now had to decide. "I think pressure from outside is not the right instrument to convince people," added Merkel who said the EU had taken a further - and final - step towards Britain. "We expressly support this step. But this is not about pressure, it is about partnership where one tries to protect one's own interests and others' interests to find a solution," she said. Merkel said any decision on a delay to Brexit would be taken after the British parliament had voted. Belgium's Michel said the latest proposals were a step forward.